Although universally credited for being a first rate blues artist, one must never underestimate the fact that Rory Gallagher had outgrown the basic blues format on a number of occasions throughout his fruitful career. Come to think of it, Gallagher’s reputation for innovation has in many ways kept him miles ahead of the more celebrated blues guitar opposition since the Taste days. With a solo career beckoning, Rory’s musical spectre continued to broaden, as folk and jazz influences became an equal partner in the man’s song-writing processes. While practising brotherly love with his band mates during the next years, Rory was steadily gearing up for the next step in developing his sound, not long before boldly deciding to pursue a more rock oriented direction. It was amidst recording material for the follow up to the “Calling Card” album that Gallagher came to grief with the way things were progressing, with discontent finally taking the best of him, in the end forcing him to disband the four piece band format that had been with him since Deuce (1973). The unmixed recordings were put on the shelf, where they remained pining for some 30 plus years, until they were resurrected by Rory’s brother Donal, much to the delight of the ever eager Gallagher fans. As one might guess, we are not dealing with a consistent sounding album, which is understandable to some extent. There is a strong scent of looseness filling the air on most of the “Notes from San Francisco” recordings. Hastily compiled arrangements paired by unconventional mixing input are clearly suggesting that serious work was being done around the frameworks of potential album compositions at the time. Although production is kept to a minimum, no doubt this in-depth look into the band's writing and recording process will please devoted Rory followers. On some occasions only minor alterations were necessary in order to help fully develop the material's potential. Compared to the final outcome on “Top Priority”, which emerged a couple of years latter, “Public Enemy No. 1” is slightly slower paced with guitar buried deeper in the mix. The song’s vibrant live felling is utterly inspiring; as Lou and Rory both excel in stretching out their fingers. “Fuel to the Fire” starts of in an almost disturbingly light-hearted manner, with Rory acquiring a lovely but somewhat featureless tune. Although still rough around the edges, hence carrying more raw energy, “Fuel to the Fire” proves to be an unforgettable experience, with Gallagher’s inconsolable resonating guitar tone easily sucking you in. On “Mississippi Sheiks” some extra excitement is added on account of a southern flavoured string solo, presenting the question of an alternative direction the song could pursue had it struck to the presented format. Even in such an unsteady environment Gallagher’s special genius grabs you by the neck on a number of occasions. There are moments of pure brilliance lurking wherever you turn. Rory’s slide work on “The Mississippi Sheiks” is exquisite! Once again perfectly capturing the high energy of a live performance is “Persuasion”, another jaw-dropper from the list of overlooked Rory Gallagher gems. The man’s unearthly gifts simply can’t be overestimated. “Rue the Day” shows all the sings of a rushed rock & roller, possibly even a throwaway, right until another inspired Rory Gallagher solo emerges out of oblivion and the song suddenly seems to grow wings. The second disc provides its own portion of excitement as well. This live recording captures a December 1979 show from The Old Walford in San Francisco. This is pure class from the three piece band, which was just out of the studio, where they finished recording the “Top Priority” album. Firing on all cylinders, they delivered an understandably tight sounding set of twelve songs, some of them old favourites like “Bullfrog Blues” “Country Mile” and Tattoo’d Lady”, now showcasing a rough edged hard rock makeover, but still loosing none of the original sharpness in the process. 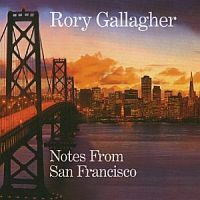 With Gallagher putting his foot down on numbers like “Shadowplay” and “Follow Me” the high energy ambience of “Stagestruck” is always only a nose bleed away, making “Notes From San Francisco” a priceless and therefore a much welcome addition to the Rory Gallagher catalogue.